Males show unusual color which is hard to describe. see: http://www.cichlid-forum.com/profiles/species.php?id=1079 These fish are very slow to show full color and only one male will show color in a group. 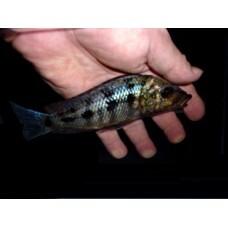 Male color starts out as brown around 4" and turns to full color after 5" or more. Despite their larger size, this fish is very peaceful and can be shy. Do not mix it with larger more aggressive haplochromines. This fish is occasionally available through my special order lists. Best Kept as a single male in an all male tank with calmer Aulonocara Peacocks and Milder Lake Malawi Haplochromines or in a breeding group. Best group for breeding is one male with six females.